At the beginning of each year, we often see people around us making different types of resolutions and setting various goals. On social media, people will go crazy with “weight loss goals” for the year, or “academic achievements” or even things like “fitness regimes” and so on and so forth. 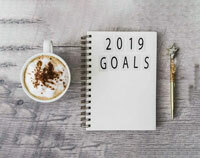 Whilst resolution lists and goal setting has become the norm and is not uncommon, perhaps it is time that we look at it from a different perspective. We have perhaps never stumbled across or heard of a “character goal”, or “habits and behaviour in my life that I need to change,” and why is this so? Why don’t we see people wanting to make a positive change in their own behaviour, or goals for better akhlaaq (character)? Why don’t we see resolutions for a more positive approach to the mother-in-law/daughter-in-law, being kinder to the spouse, or being gentler and more patient with the kids? We also see fitness goals with people wanting to increase speed, stamina, flexibility and endurance. So now we need to think, “How can I achieve my goals of ‘strengthening’ my imaan and taqwa, and ‘increasing’ my ‘ibaadat?” If we adopt this mindset, we will slowly but surely start weaning ourselves off these sins until we will be able to leave them out altogether. Everyone starts somewhere. The important thing is to start. The beginning of the year also brings a new school and madrasah time table with changes in time for junior kids and senior kids alike. This should make us ponder that when the times are changing, is my life also changing for the better, or have I stagnated completely? Has our whole life become a routine of eating, sleeping, socializing, cooking, exercising, cleaning and relaxing, without any time for Allah Ta‘ala? If so, something has to change. Let’s make our own time table. As housewives, we know how time can fly even though some of us spend the whole day at home! Let’s make a routine and include some time for azkaar, for our daily ma’moolaat, ta’leem, Quraan Majeed recitation, and also allocate time for muhaasabah (introspection), where we can reflect on our day. Let us ask, “Did I hurt anyone today? Did I fall short with my spouse? Was I too hard or too lenient on my kids? Am I progressing? Is my home in order?” This time table will give us some direction on how to plan the day, week and month ahead, and will aid us to organise better, otherwise our days will pass aimlessly. By organising our time, we may be surprised to see how much more we can get out of the day! Everyone around us, worldwide, is struggling to climb the road to worldly success and to reach the top. Everyone wants a piece of the cake, wants to earn more and enjoy more. Earn more to live better and make the most of life – it’s an international buzz and a craze. That’s why there’s “no time”, because we have piled so much onto our plate that we needed to take a second and third plate. Our days are so full because we have this to do and that to do. We have this class, and that coffee date and this function, and if we are completely honest, we know that we are not giving the time where we are supposed to. We don’t visit the sick and destitute, feed the poor and assist the elderly and weak. After a while, we hear that a relative has passed away, and our lives still carry on in the rat race. It starts with ourselves, that’s the stepping stone. Each person has to work on himself and correct each weakness to become better, more punctual and more focused. In this way, we will see a “character transformation” and not just a mere “body transformation”. May Allah Ta‘ala inspire us all and assist us to transform, aameen.